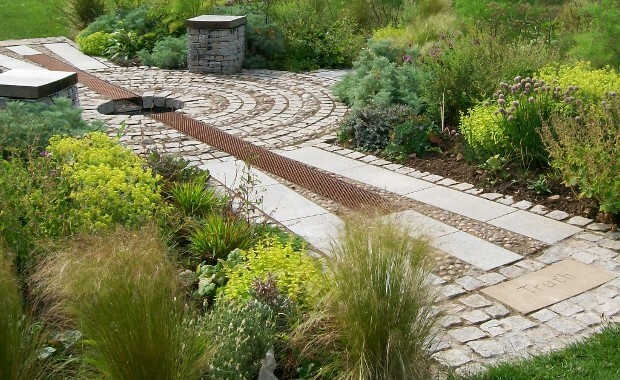 Matthew Jackman originally designed The Quaker Meeting Place Garden for the Three Counties Spring Garden Show in 2010, where it won a silver medal. He envisaged his creation as “a calm thought-provoking and focused space where Friends can meet in quiet meditation”. The circular theme recreates the atmosphere of a Quaker meeting. The Quaker Meeting Place Garden was awarded a silver medal. After the Show, Malvern Quakers decided to purchase the garden for the benefit of the town. It was recreated in the grounds of Malvern Youth Centre, visible from the road. Working with Transition Malvern Hills, the young people are sharing the care of the garden with Malvern Friends. It was the users of the Youth Centre and their families that led to an informal renaming of the Garden: we noticed that they were calling it The Quaker Peace Garden, unconsciously reflecting the association of Quakers and Peace. We have now adopted this name. It is up to Quakers to encourage the use of this lovely resource and enable it to be part of our wider witness to Malvern. We currently hold a quarterly meditation on peace at the Garden, anyone is welcome to join us — dates will be shown under Events on the Home page. The Quaker Peace Garden is situated outside Malvern Cube (formerly the Youth Centre), next to South Worcester College on Albert Road South.